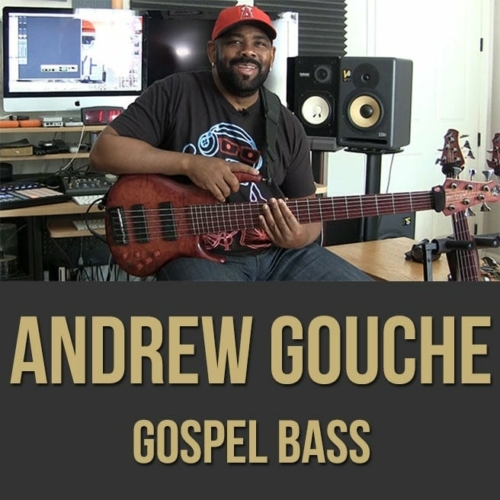 For over 30 years, Andrew Gouché has been considered the premier Gospel bass player. Andrew began his career with the late Reverend James Cleveland and has since performed and/or recorded with The Hawkins Family, Yolonda Adams, Andraé Crouch, Mavis Staples, Israel Houghton, Reverend James Moore, The Mississippi Mass Choir, The Mighty Clouds of Joy, Kirk Franklin, Ladysmith Black Mambazo, BeBe & CeCe Winans and Vanessa Bell-Armstrong. Andrew has also worked with a wide variety of non-gospel acts, including The Jazz Crusaders, Donna Summer, Cheryl Lynn, Madonna, Snoop Dogg, Warren G, Destiny’s Child, Julio Iglesias, Michael Jackson, Dionne Warwick, Whitney Houston, Gladys Knight, Billy Preston, Joe Cocker, Patty Labelle, the Temptations and many others. He also served as the long-time musical directly for the legendary Chaka Khan.